It seems I have developed a particular fondness for beets this fall after making orange and beet soup a few weeks back. Since then, beets have been a regular feature in my fridge. This is sure to please my friend Mike, who has been asking me to make borscht for a long time now. I've just recently come across the perfect recipe and I will be presenting a creamy beet borscht soon. Expect a dinner invite, Mike! 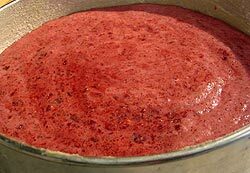 I was originally going to make another beet soup with the latest batch, until I came across this unusual recipe for beetroot cake. 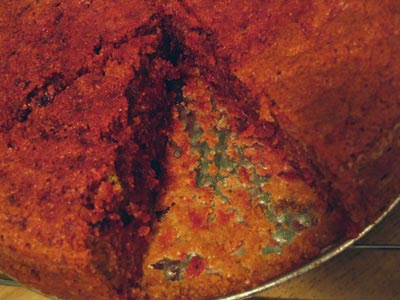 I wasn't sure what to expect, but after a few bites of this almost savory tasting spongy cake, I was hooked, as were my guests. I can honestly say that this was one of the most pleasurable cake eating experiences I have ever had. Honey is used as a sweetener rather than sugar, so it's not too sweet, instead relying on the flavor provided by the beets and spices. The addition of cornmeal also gives the cake a slight crunch. The middle of the cake is almost pudding like, while the edges of the cake have a more traditionally cakey texture. It was unanimously agreed that it should be enjoyed from the inside out. 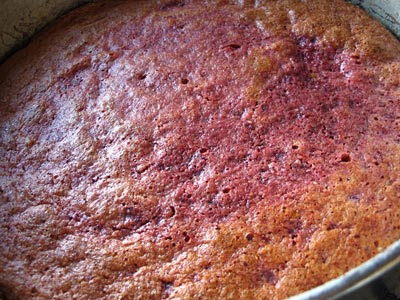 You can use yellow or red beets for this cake. I choose the red beets because I don't recall ever enjoying a red cake before. Boil the beets for 1 to 1 1/2 hours or until soft. Drain and let cool. Cut off the coarse ends and rub the skins off. Transfer to a bowl and mash until smooth. Grease and flour a 9 or 10 inch springform pan. Preheat an oven to 350°. In a large bowl, combine the mashed beet, ginger, egg yolks, honey, vanilla and olive oil. Whisk together until well combined. Add the baking powder, cornmeal, orange juice and orange zest, along with the salt, spices and flour. Stir until just combined. In a small bowl, beat the egg whites until stiff peaks form and then fold into the batter. Transfer the batter into the prepared pan. Bake for 35 to 45 minutes or until a toothpick or cake tester inserted into the middle of the cake comes out clean. Cool before serving. Top with a cream cheese icing if desired. I'm a complete beetroot fiend - LOVE the stuff. 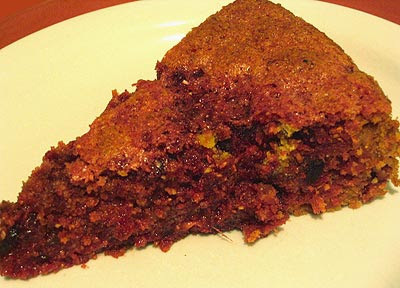 I've often made a beetroot and chocolate cake, but I love the look of you're spicy beetroot cake. It even has that lovely beetroot-pink blush on top - not something you get with the chocolate version. Oh, I'm looking forward to trying this. Wow! nice cake..Have not tried any cakes. Looks delicious. who wud have thought that u can make cake out of beets!!!! Its amazing to know cakes/breads out of 'I cant think of' veggies -carrots,zucchini and now Beets! nice idea with beetroot. I have made halwas out of it but never a cake. very nice. Beet halwas? That sounds divine. I'd love to get that recipe. As one fortunate enough to have tasted this I cannot recommend it highly enough. It is very intriguing! I think I would quite like it with the suggested topping. I have only tried beetroot in chocolate cake. It was very moist and light!